I.A.T.S.E. Local 212 serves many of the best theatre, production companies and scenic shops in the Southern Alberta Region. We provide the crews that build, set up, run, and tear down the biggest shows in Calgary. From building internationally acclaimed sets for Broadway and touring productions as Wicked and Chitty Chitty Bang Bang at F&D Scene Changes, crewing productions at both of Calgary's regional theatre companies, Alberta Theatre Projects and Theatre Calgary, to setting up the shows and manning the stage at top concert events in the Scotiabank Saddledome and Southern Alberta Jubilee Auditorium, Our members are ready to bring their expertise and professionalism to any production. 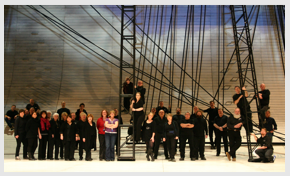 We also have collective agreements representing employees of the Calgary Opera and the Alberta Ballet. Step 1: Click on the link to the left Basic Tool Requirements. If you believe you have the ability to work in stage, please complete Step 2: Stage Caucus 2 General Permit Application Form. Please be sure ALL requirements have been met prior to submitting your application to IATSE 212 - INCOMPLETE OR PARTIAL APPLICATIONS WILL NOT BE ACCEPTED. Direct Deposit is mandatory, please ensure banking information is completed. Be sure to include a VOID cheque or bank direct deposit form. Be sure to include a letter of good standing from your home local. Step 1: Click on the link below Stage Caucus 3 - Theatre Company Requirements. If you believe you have the education and techinical skills to work in any of our Theatre Companies, please complete Step 2: Stage Caucus 3 - Theatre Company Application Form. Stage Permittees: The Union operates a dispatch system based on qualified seniority. The seniority number is based on a person's induction date into the Union. Qualification is determined by the Departments, based on testing, certification etc. A Head of Department on a production informs their Production Manager that they require a certain number of crew, and then the production calls the Union and places a 'Hall Call' for the required number of crew persons. The Dispatch person goes to the department list and phones those people who are listed as 'available', in order of their seniority number. This availability designation is up to the members and permits to keep up to date. You can do this on the secure website within your My Availability page on your profile or by phoning Stage Dispatch @ 403-212-0383. Information regarding our Stage Agreements is private and secured via login.